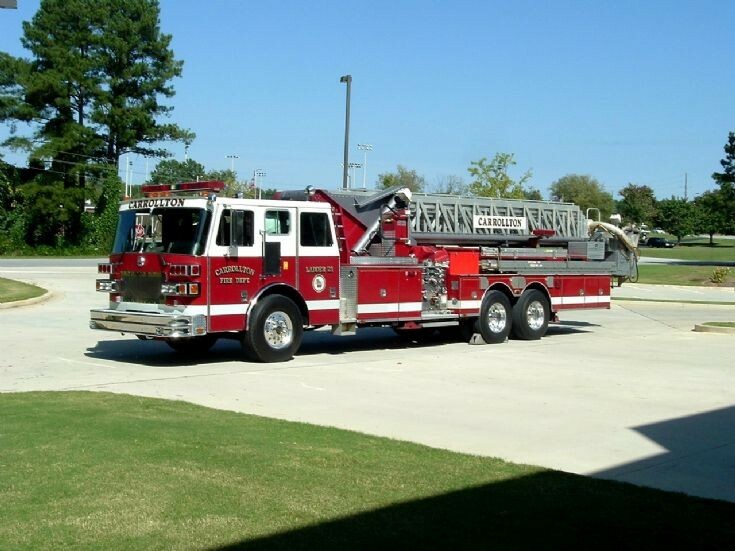 Picture is of a Reserve Sutphen Ladder formerly Ladder 21 for the City of Carrollton Fire Department. This mid mount aerial platform quint configuration is typical of Sutphen, who built many similar units with ladders from 65 to 100 feet. The design keeps the truck height nice and low, which is helpful if it has to live in an older fire station, or if its response area includes low bridges, and it also helps keep the center of gravity low too, which makes for safer handling. But the obvious downside is that the vehicle is very long - and maneuverability is challenged as a result. For some reason, the addition of a rear steering axle, which greatly improves the turning radius and is very common in Europe, is almost unknown in North America. Added by Rob Johnson on 16 June 2018.